I haven’t been blogging for a while – and I have missed taking the time to jot down some thoughts on things that are happening in my various roles at the University. The end of the summer has been a busy time – lots of grant writing, and preparations to bring in a new class of both undergraduate and graduate students. This week I’d like to focus on our new group of postgraduate students in the Master of Energy program. The program is an interdisciplinary program for students from Science, Engineering and Business. The program had around 40 students in various phases of their degree right now. This week I’ve really enjoyed meeting the new intake of students. They are all extremely energetic (excuse the pun!) and have a real hunger for knowledge that they truly hope to “change the world” with. The majority of the students came from overseas – and literally come from every corner of the globe. 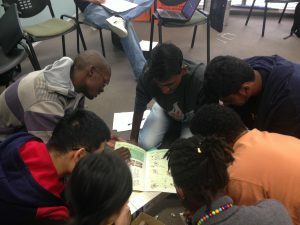 We have students from North America, South America, Asia, Africa, Europe and the Pacific all in class together. I travel a lot and believe that global problems – such as improving access to clean energy worldwide – are best solved through global collaborations. 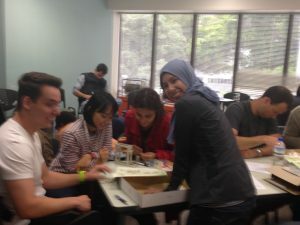 We kicked those collaborations off at an icebreaker event last week where the students worked on building models of energy related devices (such as wind turbines) from some kit-sets. I look forward to seeing what ideas the students build while they are with us. I enjoy the fact that the staff and students I work with have tremendously diverse backgrounds but share a passion for common scientific questions. I am also proud that NZ’s Ministry of Foreign Affairs and Trade lists renewable energy as a priority area for their scholarship funding. That means some of the students in our new cohort are supported through this scholarship scheme – which is then a mechanism for exporting Kiwi energy “know how” offshore. Access to reliable/affordable electricity is transformative in society. Most (but not all) New Zealanders can take that their access to grid-connected electricity for granted. Locally I was part of a team late last year which reflected on the state of the nation (in particular in my section access to clean energy) as part of the Habitat III report to the United Nations. Sharing ideas and experience via organisations such as the UN is important. However our postgraduate program is like a mini UN on a daily basis! Posted in Uncategorized and tagged energy, Habitat III, Master of Energy, Ministry of Foreign Affairs and Trade on March 14, 2017 by rarc002. I am so grateful to be in the 2017 MEnergy class which presents an incredible diversity of students and networks! In just 2 weeks of learning, already looking forward to implementing the newly gained knowledge back home in Kenya. We hope you gain lots of good ideas you can use at home in Kenya.